Ronnie O'Sullivan hopes a revolutionary new snooker competition can revive the sport and provide an antidote to the "boring" World Championship. Power Snooker, which boasts innovative rules and will feature games lasting only 30 minutes, will see players battle for points instead of frames. 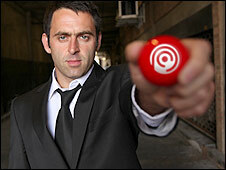 "This is the future of snooker and a few people have got to get their heads around it," O'Sullivan said. "Snooker needs a new audience. A game ending in 30 minutes is exciting." The inaugural tournament, which will take place at London's O2 Arena on 30 October, will see the world's top stars going head-to-head. While Twenty20 has provided cricket with a new lease of life and younger audiences, O'Sullivan is excited about embracing the quick-fire format which will include time restrictions for shots and bonus points for potting certain balls. "Anything new is a challenge," the three-time world champion added. "I find the World Championship really boring. I've won it three times but 17 days in Sheffield is draining. People just want to pitch up and play. "It is the year 2010 and we are not stuck in the 1970s anymore. I can understand that people still like their long endurance games, but for me the excitement of playing a game that keeps you on your toes, keeps you on your edge, is something I am really looking forward to. "It is going to change snooker. The crowd will love it and the public will enjoy it. I cannot find a flaw in it. You just want some excitement in your life and this brings excitement." O'Sullivan has confirmed his participation, with new world champion Neil Robertson, China's hottest star Ding Junhui, Mark Selby, Ali Carter, Shaun Murphy, Belgian wonder-kid Luca Brecel and six-time world championship finalist Jimmy White being lined up to play. Gunner, the competition's brainchild, said: "It had struck me for some time that the game of snooker needed a new and exciting transfusion. "Having seen how Twenty20 cricket has revitalised that sport, I am delighted to have come up with the concept of Power Snooker and seen the positive reaction from within the game." Hearn, who was handed control of World Snooker after a player vote in June, has helped to regenerate interest in the sport with the introduction of a number of new tournaments. The 62-year-old, who also chairs the Professional Darts Corporation (PDC), expressed his delight at the latest addition to snooker's calendar for the new season. "We are 100% behind Power Snooker. In this new time for World Snooker, it is important for us to embrace new formats and new ideas. "World Snooker welcome the Power Snooker event which we hope will bring new audiences and new fans to the sport." The plan is also to have players wearing microphones during the action to encourage more interaction with the crowd.